21 Days of Blindness Challenge: We Walk by Faith and not By Sight—Day 21: IT IS FINISHED! 1 O Lord, hear me as I pray; pay attention to my groaning. 2 Listen to my cry for help, my King and my God, for I pray to no one but you. 3 Listen to my voice in the morning, Lord. Each morning I bring my requests to you and wait expectantly, (Psalm 5:1-3, NLT). Day 21—We made it. Wow! What a journey this past three weeks has been. In the beginning of the challenge, I told you that one of the primary reasons why I started this challenge was in response to story about a pastor who after a yearlong journey of “living without God” decided that He was now an atheist. I wanted to challenge myself and my readers to see what life looked when we actively pursued God. So what did we learn? The first thing that we probably discovered was that life is not easy. In Matthew 16:24-26, Jesus told His disciples, “’Whoever wants to be my disciple must deny themselves and take up their cross and follow me. 25 For whoever wants to save their life will lose it, but whoever loses their life for me will find it. 26 What good will it be for someone to gain the whole world, yet forfeit their soul? Or what can anyone give in exchange for their soul,’” (NIV). The moment that we decided to embark on this challenge, the devil got busy. There were obstacles and roadblocks that attempted to make our journey difficult. However, here is what I learned. Greater is He who is in us, than he who is in the world, (1 John 4:4). In John 16:33, Jesus said, “Here on earth you will have many trials and sorrows. But take heart, because I have overcome the world,” (NLT). The name of Jesus is greater than any other name in this world, (Philippians 2:9). The name of Jesus is greater than death, Satan, sickness, sadness, fear, debt, worry, loneness, anger, and the list goes on and on. Know that God is not deaf to our prayers. Psalm 6:9 says “The Lord has heard my plea; the Lord will answer my prayer,” (NLT). The verse does not says that God might answer our prayers. It said that He WILL answer our prayers. Today, know that as we wait patiently on God’s answers to manifest, the answer is already waiting in the wings. Lord, more than 2000 years ago, you sent your one and only son, Jesus Christ, to die for all our transgressions. Lord, we thank you. We thank you for your mercy and your deliverance. On Jesus’ final moments on the cross He spoke the final words that confirmed our destiny on Earth and in Heaven. Jesus’ final words were: It is finished! Lord, thank you that everything that has ever been promised to us has already been delivered since before the beginning of time. Lord, we thank you that IT IS FINISHED! 21 Days of Blindness Challenge: We Walk by Faith and not By Sight—Day 19: Was It Worth It? Have you ever wondered whether it (whatever it may be) was all worth it? Well, you are in good company. During the middle of John the Baptist’s deepest pain, he sent his disciples to ask Jesus whether or not He (Jesus) was the chosen one. Essentially, John the Baptist wanted to know whether the sacrifices and the choices he made were all worth it (Luke 7:18-35, NLT). Ask God for what we want. KNOW that we have received what we have asked for. I know today that there are people right now who are struggling with their faith in God. You feel like you have made sacrifices. You have trusted God. You have stepped out on faith, but you still have not seen what it is that you have believed for. I ask that you just hold on. Apply the formula found in James 1:5-8. Ask God for what you want. KNOW that you have received what you have asked for. Early in the Book of Genesis, a great flood washed over the earth. Noah and all the animals were weathering the storm aboard the ark. It must have felt like the storm was not going to relent. I wonder if Noah ever questioned whether he would survive the flood. I wonder if Noah questioned whether God had forgotten about him. During the greatest storms in our lives, it is easy for us to think that God has forgotten about us. Thankfully, He does not forget. Genesis 1:8 says, “But God remembered Noah and all the wild animals and livestock with him in the boat. He sent a wind to blow across the earth, and the floodwaters began to recede,” (NLT). Just know that God has not forgotten us and left us to fend for ourselves in the storm. At just the right time, He will cause the tides to recede and to relent. Today, I pray that your floodwaters will recede and that God will answer your prayers. In Jesus’ name. Amen. One of my favorite books growing up was “Are You There God? It’s Me, Margaret,” by Judy Bloom. I love the sentiment of the title. It’s a question that we have all asked God. Today, we ask: Are you there God? It’s me, (insert your name). In our fallen world it’s easy to question God’s whereabouts. There are so many social and political issues that overwhelm the news. It’s easy to wonder if God cares about His World–If He cares about you. Why is God so seemingly quite? Are you there God? It’s me! That seems to be the cry of a generation. 4 What is man, that thou art mindful of him? and the son of man, that thou visitest him? 5 For thou hast made him a little lower than the angels, and hast crowned him with glory and honour. 6thou madest him to have dominion over the works of thy hands; thou hast put all things under his feet, (KJV). God cares so much about the intimate details of our lives that He even knows the number of hairs on our heads. Our finite knowledge cannot begin to explain the things of God. I don’t know why God sometimes appears silent when we need Him the most. I don’t really know whether He is, silent, that is. Maybe we miss His voice that sometimes comes in a whisper. The nature of these questions are too complex for me. However, I do know this. Gideon asked for a sign of God’s favor, and he got it. David asked for protection, and his enemies fled. The woman with the issue of blood needed health and was healed when she touched the hem of Jesus’ clothing. What do you need? Shout it from the rooftop. Scream His name! Petition His promises! Jesus, Jesus, Jesus! Are you there? It’s me! Today’s Prayer: Lord, we come to you with hearts surrendered. Are you there? It’s me. Lord, hear our heart’s cry. Lord, show us your unrelenting love. Give us a sign like you did for Gideon. Today, we ask that you show us a sign of your awe and might. Lord, grant us protection as you did for David. Make our enemies our footstools. Heal our bodies like you did for the woman with the issue of blood. Lord, we thank you, and we bless you. In Jesus’ name. Amen! The realtor’s words got my wheels turning. How many of these catchphrases have we embraced and taken as truth? Who says we can’t have it all. I believe that this saying and many other catchphrases of its kind are lies the devil told to keep us confined by the walls of mediocrity. If God said it, we can do it, and we can have it. This made me think. What other lies have the devil told and disguised them as aphorisms? 1. You can’t have it all. 2. No good deeds go unpunished. 3. All good things must come to an end. 4. Nice/Good guys/gals finish last. 5. It ain’t over until the fat lady sings. No, it’s not over until God says it’s over. 6. The devil’s in the details. The Bible says that the power of life and death lies in the tongue. We have to be cognizant of the things we say because they sow the seeds for what we will eventually believe and become. Lord, we stand on the Word of God. We declare what it says. We speak life into our dreams. We thank you, and we praise your name. In Jesus’ name we pray. Amen! Today (January 19, 2015), in America, our country will pay homage to the legacy of Dr. Martin Luther King Jr. In August, we will commemorate the 52nd anniversary of his revolutionary I Have a Dream speech. Revelation 22:13 says that God is Alpha and the Omega—the beginning and the end. However, we are but a mist, (James 4:14). God’s purpose for our lives spans far beyond our final breath. When Dr. King said that he had a dream that all men and women would enjoy the inalienable rights granted to them by God, I do not think that he could have possibly imagined the magnitude of its impact. The revelation of his dream did not simultaneously manifest. The unveiling of the layers has taken years, and the layers are still unfolding. Indeed, God’s thoughts are not our thoughts, and His ways are not our ways, (Isaiah 55:8-9). As we move into Day 15, I challenge you to press into God. There are dreams on your heart that are so ridiculously impossible, that only the mighty power of God can bring them into fruition. Many of the dreams that God has placed on your heart are so big that it will take a generation to bring them to completion. But tonight I charge that God will give you victory in the mighty name of Jesus. You will ignite the flame of the torch. God will use you to accomplish great things. Lord, I speak prophetically over every single person reading this page, in the name of Jesus Christ. Lord, I plea the blood of Jesus over every person, every home, every town, every city, and every village. I pray that just as the death angels in the book of Exodus (Exodus 12:12-13) passed over the houses that were anointed by the blood, no harm will become those who have been anointed by the blood of Jesus Christ. I pray that all strongholds and familial curses will be broken. I pray that every person reading this page will stand on the Word of God. Lord, I pray that men and women will begin to walk into their destiny. Lord, I pray that the people of God will begin to impact a generation for Christ. In Jesus’ name I pray. Amen! So many of us have such a clear idea of what we want in a friend or a romantic companion. But, how do we compare to that list? Today marks the fourteenth day of our 21-day Challenge. The purpose of this challenge is for us to fearlessly trust God for 21 days. A big part of trusting God requires us to take a look at ourselves. Over the past few days, I have blogged about different topics in an attempt to challenge our perspective. 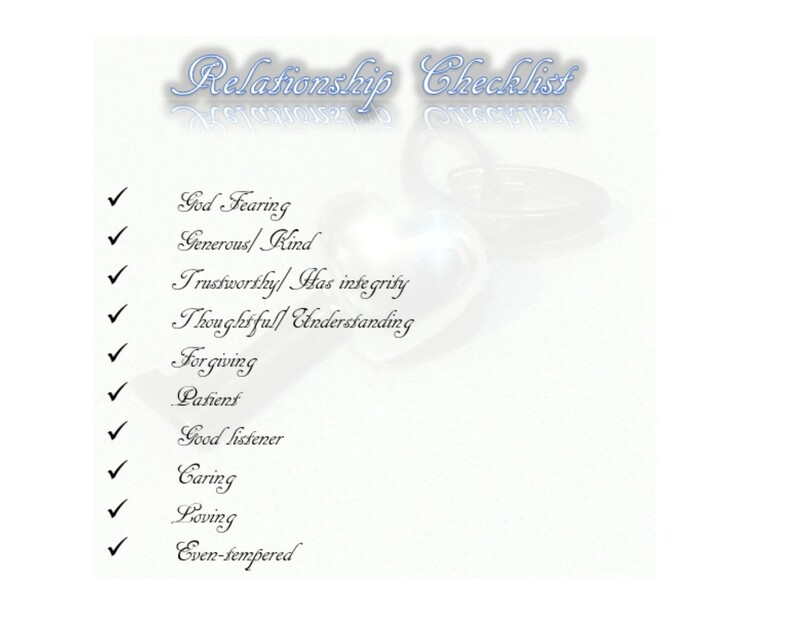 Today, I want to challenge all of us, myself included, to be the person on our relationship checklist. Many of us, at some point, have asked God to bless us with relationships, whether platonic or romantic. We want God to bring the “perfect” people into our lives, but we have not taken stock as to whether or not we are that person we are praying for. We have to remember that we are not the only ones with wants and needs. Other people have the same prayerful expectation of the people that they want God to bring into their lives. Perhaps, we need to spend today determining what our expectations of relationships are and comparing ourselves to that list. Below is a sample checklist and some ideas of how we can check ourselves against that list. How is your relationship with God? How is your relationship with other people? “If someone says, ‘I love God,’ but hates a Christian brother or sister, that person is a liar; for if we don’t love people we can see, how can we love God, whom we cannot see,” (1 John 4:20, NLT)? Do you share your resources (i.e. your time, your money, your belongings)? Even something as simple as sending a text to say “hello” could mean the world to someone else. Do you hold a grudge, or do you let things slide? Do you understand that others might not be as quick on the uptake as you, and therefore, it takes them longer to get things that might take you a shorter time? Do you actively listen, or are you always waiting for a pause in the conversation to initiate your turn to talk? Can you see past other people’s shortcomings? How do you treat others who aren’t your friend? How do you treat people you don’t like? How do you talk to and about people? Are you quick to judge and point out other people’s faults? Are you quick to listen, slow to speak and slow to anger, (James 1:19). I am so grateful for those of you who have gone the distance with me on this challenge. It truly has been a remarkable experience. Even though we haven’t quite reached our 21-day mark, I have learned so much about God and myself in the process. I’d like to share with you some of the things that I have learned. When all is said and done, and everyone has left, the only one left standing is God. “One who has unreliable friends soon comes to ruin, but there is a friend who sticks closer than a brother,” (Proverbs, 18:24, NIV). God is the only one who will ever love us unconditionally. He knows our strengths, our weaknesses, and our shortcomings, yet He chooses to love us anyway. We can talk to Him about anything without fear of judgment. He keeps our secrets. He is trustworthy. Most of all, He is the only one with the power to deliver us from our circumstances. Don’t let other people disqualify you from the race that God has set forth for you. Sometimes the people in our lives can’t see beyond our lives, ours pasts, our shortcomings and our aptitude to recognize our calling. The truth is, it isn’t their place to validate God’s plan. Oftentimes, people who bash others are acting out of their own insecurities. More times than not, jealousy is at the root. There are people in our lives who want to dictate how, when and if God should bless us. Thankfully, our future is not their call. Not everyone on our team is our fan. Remember Jesus, the Son of God? Even He faced skepticism about his calling from the very people around Him. According to Jesus, “no prophet is accepted in his own hometown,” (Luke 4:24, NLT). Be quick to listen and slow to speak (James 1:19). Our attempt to fill silence with useless chatter could be our biggest downfall. If we would just listen to what people are saying, and not saying, we would know who people are long before they have the opportunity to show us. Sometimes, relationships run their course. We are not God. We cannot save everyone. As difficult as it might be, we have to learn to step back and allow God to do His work in others as He did in us. We should remember that everyone does not run life’s race at the same pace. Our efforts to allow others to catch up with us could very well be the thing that is slowing us down. Letting go is really just that. A few years ago, I took swimming lessons at the YMCA. The very first thing that they taught us was how to float. I was very fearful of the water. My fear made learning VERY difficult. Every time the instructor told us to release our bodies in the water, I couldn’t. I always had to have one foot touching the bottom of the pool. I think that is how many of us live our spiritual lives. God tells us to cast ALL our burdens on Him, yet we have a Plan B. We half-heartedly follow His instructions just in case He fails. My friend, that’s not faith. That’s fear. Letting go means that both feet must come off the ground. Some people call the voice in the back of our heads instinct, but I choose to call it the Holy Spirit. The Bible says iron sharpens iron, Psalm 27:17. The only way that you and I are ever going to maximize our full potential is by surrounding ourselves with likeminded people. As I was meditating this morning, I thought about what I wanted to post today. I decided to repost an entry from a few week ago. Enjoy! John the Baptist gave his life to Christ—literally—yet he died one of the Bible’s most gruesome deaths. “And blessed is the one who is not offended by me,” (Matthew 11:6, ESV). Some translations say, “’God blesses those who do not turn away because of me,'” (NLT). When John the Baptist heard in prison what Christ was doing, he sent his disciples to ask him, “Are you the one who was to come, or should we expect someone else,” (Matthew 11:2-3)? Imagine how John the Baptist must have felt when he first got word that Jesus was the Messiah. Surely, all of his suffering was going to be over. Surely, he would be freed from prison and the brutality he suffered at the hands of his capturers. I believe that the reason John sent his disciples to meet Jesus might have been two-fold. First, maybe a part of him wondered whether Jesus knew that he had been arrested. Secondly, I believe that he wanted to be unequivocally sure that he had sacrificed his life for something real—something that mattered. Isn’t that how most of us who have chosen to walk with Jesus feel, or have felt at some point in time. We feel as if we have sacrifice so much. Many of us feel as if we have trusted God with everything, yet we question whether he is aware of the “prisons” in which we sit. We question whether or not we are believing in something or someone who truly exists. Many of us think that if we believe and trust in God, He will rescue us from our situations. However, it doesn’t always work that way. John the Baptist dedicated his life to Christ, yet he was imprisoned and beheaded. How many examples can you think of in your life where the people around you, including yourself, have made sacrifice in the name of God, yet He has seemingly failed them? John the Baptist must have been at his wits end. He knew that death was eminent. He wanted to know that it was all worth it—that his sacrifices were not in vain. I believe that a greater part of him wanted Jesus to return with the disciples and rescue him from death. However, Jesus did not return, he only sent word, “’Go back to John and tell him what you have heard and seen— 5 the blind see, the lame walk, the lepers are cured, the deaf hear, the dead are raised to life, and the Good News is being preached to the poor. 6 And tell him, ‘God blesses those who do not turn away because of me,’” (Matthew 11:4-6, NLT). The truth is John the Baptist’s life, and subsequent death, were the fulfillment of prophesy. His sacrifice has paved the way for countless others. Our God is a big picture God, and unfortunately (or fortunately), sometimes our sacrifices are for the benefit of others. As I close, the most recent person that comes to mind is Martin Luther King Jr. and the many people who lost their lives during the American Civil Rights Era. Many of them did not live to see the fruits of their sacrifices. However, as a result of their selflessness, I am able to freely write this blog. As a result of John the Baptist’s sacrifice I am able to know the glory of God. I believe with all my heart that when I get to heaven, I will see John the Baptist sitting in his seat of glory. I believe that many of us will be rewarded with the blessings that Earth withheld.